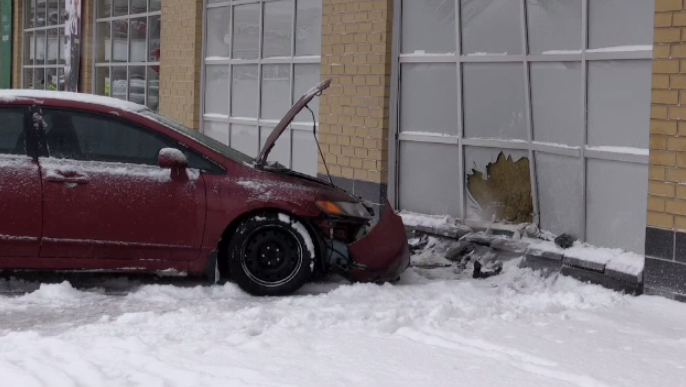 Police are investigating after a vehicle crashed into the front of an LCBO. They responded to the store on Ira Needles Boulevard on Wednesday just before 10 a.m. The male driver, 47, was taken to Grand River Hospital with minor injuries. Police say the car hit a median and then a parked vehicle before hitting the building, where it started smoking. The damage was estimated to be between $75,000 and $100,000. “We are investigating the cause of this motor vehicle collision, we haven’t been able to rule out medical as a cause but it’s still ongoing,” says Sgt. Mark Hammer with the WRPS. Later, police say the crash was caused by a medical condition. Kitchener firefighters were called to the scene and the store was closed for ventilation. There was no word on whether charges would be laid or how long the store would remain closed. Regional police say there were people nearby when it happened but say no one was injured.